Martin Luther King, Jr (27a [“I have a dream” monogram] MLK), in addressing Spelman College in 1960, said “If you can’t fly, run; if you can’t run, walk; if you can’t walk, crawl; but by all means keep moving.” He was referencing and building upon Langston Hughes’ 1922 poem Mother to Son. The sentiment, probably age-old, has unsurprisingly had legs—wings, even—in the decades since, proving a touchstone for, among others, those in the inspiration and self-help business. The sequence of four theme answers in Monday’s offering is acknowledgement of the metaphor’s enduring power. 17a. [Bot that systematically browses the Internet] WEB CRAWLER. 28a. [“The Color Purple” novelist] ALICE WALKER. 48a. [1982 Harrison Ford sci-fi film] BLADE RUNNER. 64a. [Classic red wagon] RADIO FLYER. Consistency here. In each entry the action is personified, with a an -er suffix. Interestingly, all four could be clued in reference to films. In addition to 1982’s Blade Runner, 1992 saw the release of the forced-nostalgia flop Radio Flyer, the well-received film adaptation of The Color Purple came out in 1985, and there have been a number of Spider-Man (aka the “web-crawler”) movies—including two, three? reboots—in the past decade, with more to come. Wise to have avoided that route, though, as two titles and two oblique references would have come across as unbalanced. 70a [Birds that fly in V’s] GEESE. I realize that Will Shortz is unconcerned about most kinds of word duplication, but that won’t stop me from mentioning examples when they irk. Here there’s a strong duplication of one of the key theme elements (FLYER), and it rankles. Longish non-theme material: acrosses SERGEANT and KEMO SABE, downs EMERALDS stacked with EMBARKED, TAXPAYER s/w ET CETERA. 3d [Started on, as a journey] EMBARKED, 11d [Prepare to go home from vacation, say] REPACK; so soon, alas. 61a [Sounds like sheep] BLEATS, 43a [Grazing expanse] LEA. See also 42d LEI and 49d LIE LOW. 4d [Capital of Bangladesh, old-style] DACCA. That’s pretty tortured for an early-week crossword. Right at the top, too. Ouch. 22d [Math class drawing] GRAPH. 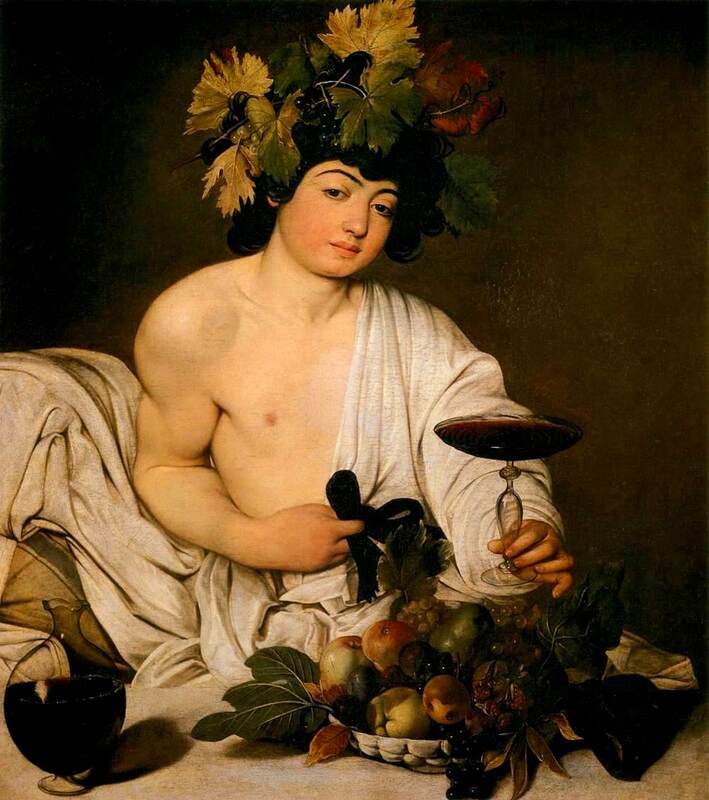 Save the GRAPE drawing for biological topology class, or possibly ART I (so happy that isn’t in the puzzle!). 52d [Liesl’s love in “The Sound of Music”] ROLF. This is the third time I’ve seen ROLF in crosswords in less than a day. The other two referenced deep massage, the eponymous technique developed by Ida P Rolf. Also, not to be confused with the Muppet canine Rowlf. Last lousy fill I’ll mention: 62d [B’way hit signs] SROS. 29d [Make butter the old-fashioned way] CHURN. As opposed to the way it’s made nowadays, via factory magic. Good puzzle. Onward and upward. Sure seems as if this one should have had left-right symmetry and black squares forming a letter in the center. 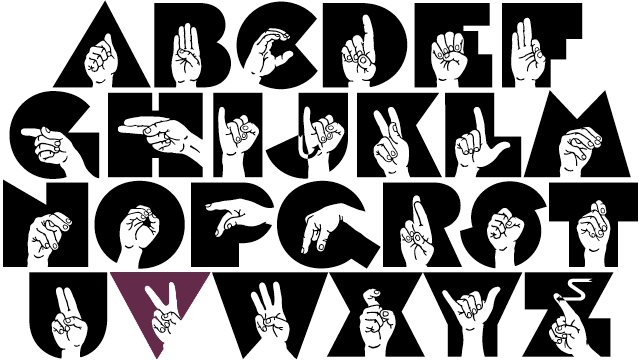 29-down has [Hand gesture for the last word of the answers to starred clues] V-SIGN. 20a. [*Statue of Nike at the Louvre] WINGED VICTORY. Think Churchill. See also 44a [Triumphed] WON. 37a. [*Had street smarts] KNEW A THING OR TWO]. Think silent countdowns. See also 65a [Double curves] ESSES. 51d. [*Jesus, to Christians] PRINCE OF PEACE. Think Summer of Love. See also 62a [Cessation of fighting] TRUCE. In addition to these three senses, it can have other, more specific, meanings, including greetings, insults, and the concept of looking. See more here. 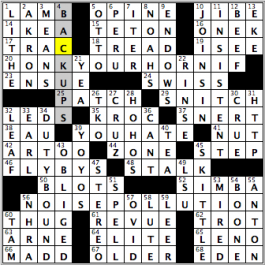 I sometimes call out crosswords for being overambitious and in the process creating unnecessary encumbrances, glaring infelicities, or just overly compromised fill. Here, however, it feels as if it wouldn’t have been too difficult to add just a little more. If not the conceit of grid pattern as mentioned above, then how about something with letter distribution? 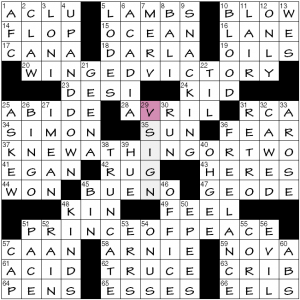 Consider this: there are three Vs in the grid—one in the revealer (crossing entry: French month AVRIL), one in the first themer (crossing entry: MERV Griffin), and … one in the lower right-hand corner (entries: Bossa NOVA, banal EVIL). What if that stray third one was removed and relocated to the seventh column, where the other two happen to reside? Stay with me here. Obviously, it would be ideal to have it incorporated into the theme entry, but that simply isn’t feasible. Still, how about 54d ONUS replaced by OVER, OVEN, OVAL, OVUM, OVID, or OLAV? Then there’d be three Vs in the grid, the symmetrical letters aligned down the center of the puzzle. Wouldn’t that be spiffy? The grid’s way more than halfway there already. Long verticals: 4d [Variable, like the stock market] UP AND DOWN, 36d [Self-employed, as a writer] FREELANCE, 9d [Giving in to the munchies] SNACKING, 38d [Cut short] TRUNCATED. 41a [Pulitzer-winning novelist Jennifer] EGAN. For A Visit from the Goon Squad (2010). 21d [Actress Davis] GEENA. Her “Geena” is short for “Virginia”. 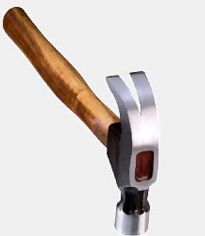 2d [Nail-removing hammer part] CLAW. I lied. Can’t come up with a fifth thing to say here. But I really wanted to. Not a huge fan of using entire quotes as a theme, but that’s probably because I’ve never been good at it, more so than just the sheer fact that the theme is a quote. Also not a huge fan of spelling out the number in reference to a race, like today’s entry of ONE K (16A: [Short race distance, briefly]). 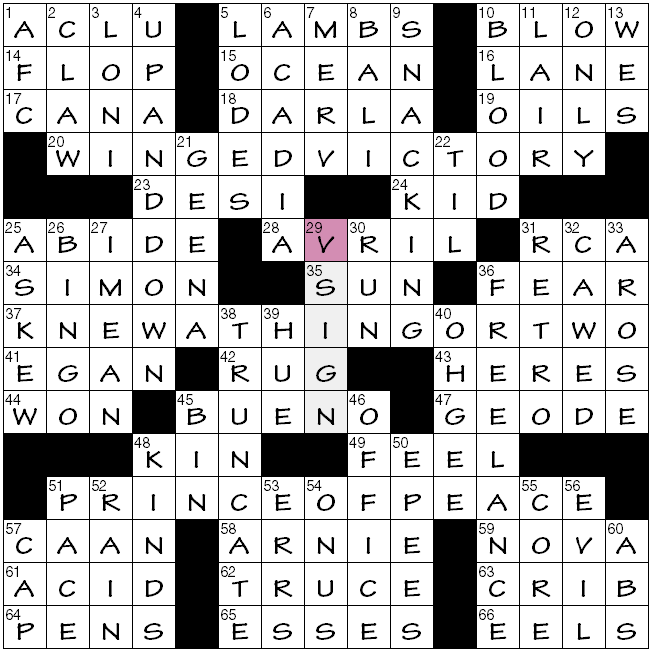 It goes back to when I couldn’t complete a NYT puzzle (or completed it, and had an error) because I couldn’t see “TEN K.” Had the ‘ten’ part, then was stumped for the last letter. After finding out what it was, I definitely not too happy. “It’s 10K, not Ten K!” Oh, well. New fact I got to learn from IKEA: the actual name of the person who founded it (14A: [Chain founded by Ingvar Kamprad]). Since his initials are I.K., is it possible that the first two letters of the chain reflect that? I’ll have to look it up…or ask an Ikea worker when I’m in the store next, and see if they’re up on their Ikea history! Reason I’m in a rush is because I’m helping out with some editorial work during Wimbledon today, and, as we speak, I’m watching a SWISS player on the court, French Open winner Stan Wawrinka (24A: [Provolone alternative]). Well, I just said I couldn’t stay long, and look how much I wrote. 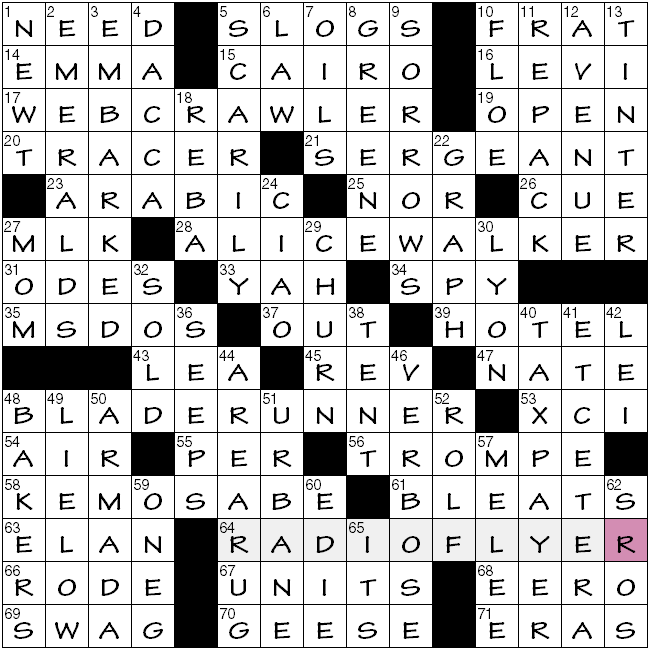 Man, I must like talking about crosswords, huh?! I should do it daily, or something like that. “Sports will make you smarter” moment of the day: LEAF (32A: [Book part]) – This past NFL Draft saw two quarterbacks taken in the first two picks of the draft. Usually, when QBs are taken 1-2 in the draft, one turns out to be a mega star, while the other flames out pretty quickly. In 1998, Washington State quarterback Ryan LEAF was the second overall pick of the 1998 NFL Draft by the San Diego Chargers, behind Peyton Manning. One is still playing and is a future Hall of Famer. Another spent only four seasons in the league, threw 22 more interceptions than touchdowns and has been jailed on theft of controlled substances. I’ll let you guess who is who. This grid has sort of a two-thirds quad-stack layout, with a couple black squares interrupting what would otherwise be quad stacks on the top and bottom. With so many long answers stacked together, I expect to see great long fill with some unsavory short crossings. 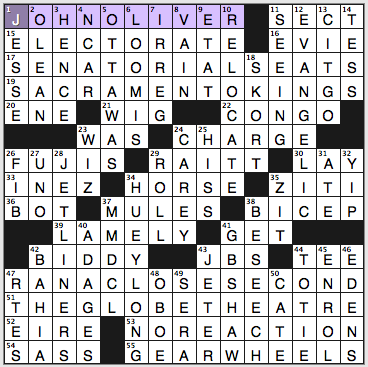 Love JOHN OLIVER, SACRAMENTO KINGS, RAN A CLOSE SECOND, and THE GLOBE THEATRE—all terrific entries. Not keen on OLEAN, NCAR, IRREG, G.B. SHAW, BAHIA, and ENROL, but none of those are entirely beyond the pale. MMDCL, hard meh. HUEY LONG is a great crossing for the bottom stack, though. 23d. [Washington pros, for short], WIZ. The Washington Wizards are called the Wiz for short? Had no idea. 38a. [Curling performer? ], BICEP. Clue needed a hint that the answer is an informal usage, with the final S lopped off. 50d. [___ & Chloe (jewelers)], CATE. Never heard of it. Apparently it’s an online jewelry purveyor. I like that HORSE and MULES are in the middle of the grid but neither is clued as an animal—we’ve got the basketball game and a pair of shoes. 3.8 stars from me. A bit easier than the standard BEQ themeless, no? This entry was posted in Daily Puzzles and tagged Andrea Carla Michaels, Brendan Emmett Quigley, Bruce Venzke, Patti Varol, Todd Gross. Bookmark the permalink. Enjoyed the NYT – nice theme entries; SROS caused a frown and I needed all the crosses for DACCA, but other than that, a very pleasant solve. Greetings from Frankfurt. Enjoyed the puzzle! And enjoyed the background info as well. There’s an error in this puzzle in 21 across.While my army service was many years ago, I’m sure it’s still true that a private does not say “Sir, yes, sir” to a sergeant, who is an NCO and not an officer. He says “sir” only to a lieutenant and other higher officers. He addresses a sergeant solely by using his rank. I thought it was OK for a private to say “Sarge.” That seems to be case in Beetle Bailey, anyway. When I was in boot camp (USMC) it was sir yes sir to our sgts. Yes siree Sgt. If your browser is slow (stuck? ), I hear it’s because Yahoo is uploading a bunch of junk. Re Noise Pollution: I wanted a review from pannonica panning pandemic pandemonium. I was reminded of Spider-Man too, but then I remembered that Spider-Man didn’t crawl on his web but *swing* on them, and WEB_SWINGER would make a hash of the theme.